In all its glory. Image: July 2016. 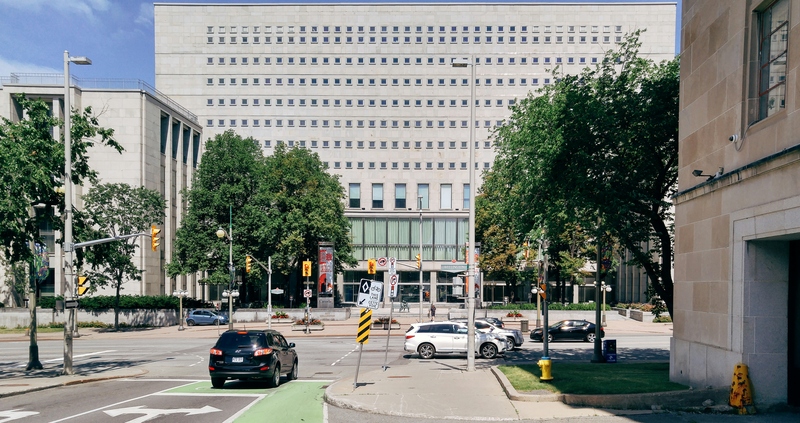 Maligned by some, I have never hidden my love for the Library and Archives building at 395 Wellington. I’ve always found Alvan Mathers’ design for the building to be both monumental and welcoming at the same time. To my eye it is certainly a “building befitting, in design and size, the dignity of the Dominion and the importance of the undertaking” of a National Library (and Archive).1F. Dolores Donnelly. The National Library of Canada (Ottawa: Canadian Library Association, 1973): 41. The National Library and Public Archives building was first commissioned in 1953, following a serious fire in the Library of Parliament in 1952. The Canadian Library Association, among many others, had long been agitating for a national library and the fire underscored the need, motivating all three parties in Parliament to agree that it was critical that it happen. After considering three options (one of which was the demolition of the Library of Parliament! ), it was decided that a new building would be constructed on the site of the wartime temporaries along Wellington street.2Ibid, 101-04. 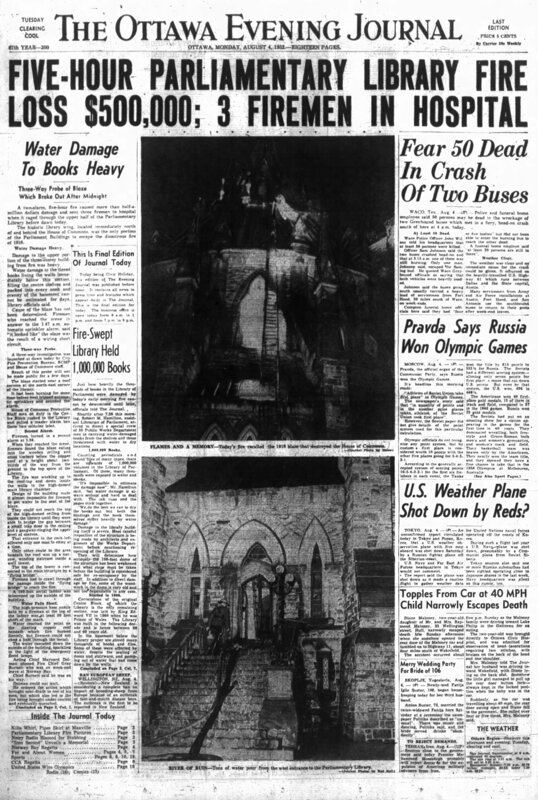 The cover of the Ottawa Journal following the fire at the Library of Parliament. Source: Ottawa Journal, August 4, 1952, p. 1. While construction may have been scheduled to begin in 1954 (with an expected date of completion in 1957), a delay in the completion of the new building for the Department of Trade and Commerce resulted in their remaining in the temporaries, pushing the new library and archive ahead to 1959. The explosion that damaged the Jackson Building on Bank street meant that Temporary No. 1 was “commandeered” and demolition delayed indefinitely.3Ibid, 135-137. 1959 rolled around, and the occupants of the No. 1 Temporary still had not been relocated to a new home. More importantly for the project, no funding had been allocated. This state of affairs remained through the 1961/62 budget.4Ibid, 147-150. Ellis-Don, the low bidder, was awarded the contract. 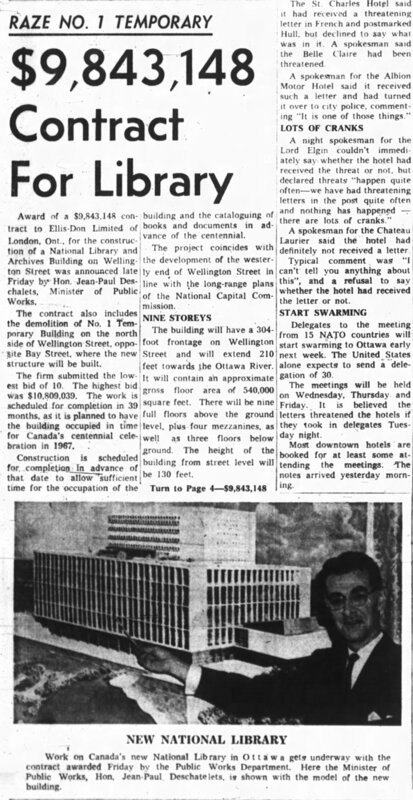 Source: Ottawa Journal, May 18, 1963, p. 1. Almost as soon as Lester B. Pearson formed his government in the Spring of 1963, Ellis-Don was awarded a $9.8 million contract (which included demolition of No. 1) and construction began in the Fall.5Ibid, 155. Below is a collection of photographs taken through the construction of the building. The citation for the gallery below is: Van’s Studio / Library and Archives Canada, Accession 1983-168 NPC, Box 05014. Below are the Mathers and Haldenby drawings of the the National Library, dated 1954. A number of changes were made to the plans between then and its eventual opening in 1967.6Ibid, 204-209. The reference for these drawings is LAC RG37M 81203/15. 1. ↥ F. Dolores Donnelly. The National Library of Canada (Ottawa: Canadian Library Association, 1973): 41.